Attention Shoe Addicts: Upper street London - Bespoke shoes designed by you! This week I enjoyed the pleasure of actually designing two pairs of shoes on the Upperstreet.com website. I have never felt so excited when online shopping! Not only is it great to have the design choice, but also to feel an intense satisfaction when designing something you know you will cherish and wear forever! The process is very easy and can be completed within minutes. If you needed more time, simply save to your own personal gallery and return when you can! My Upper Street Courts, named after myself, are classic in style and shape, yet the metallic and leopard print detailing add a frivolous touch! A new feature now available, are custom-made ballet flats. My design named after my birthplace, Cheltenham, are sophisticated shoes, mainly all black except for a flash of white snake and a diamante jewel. Watch a great video with the owners of Upper Street, two sisters Julia and Katy, explaining their love of shoes and how it all began! 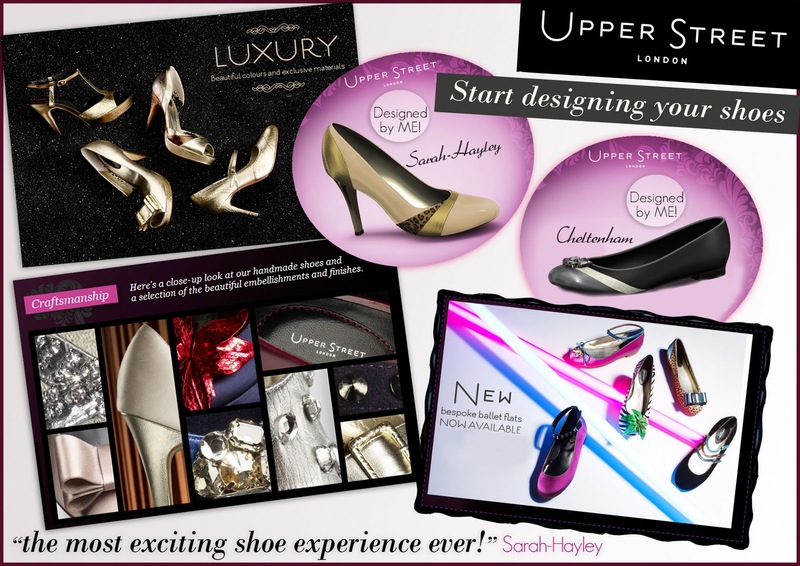 So whether you once dreamed of becoming a shoe designer, or perhaps have hunted high and low for the shoe of your dreams and failed, Upperstreet.com is your online shoe destination heaven!